Lifecycle impact is an invaluable tool in making fair comparisons. It’s easy, for example, to get hung up on the small amount of mercury in a CFL bulb, a percentage of which can escape into the environment if the bulb is crushed in a landfill. But the biggest contributor to mercury pollution is coal-fired plants, which push gigantic amounts of mercury into the environment as part of their normal operations. So how do we compare the mercury impact of the two different bulbs? 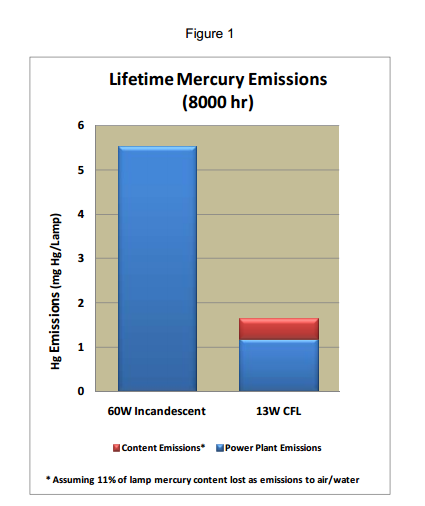 We calculate how much mercury is produced via electricity over the lifetime of the bulb (here standardized to 8000 hrs. of use, since CFLs last longer). Then we add the mercury in the bulb itself to the lifetime use figure. It seems obvious, and it’s certainly a common way to do it — but it’s an incredibly powerful way to look at things compared to the alternatives.